I bought The Beast to replace Sven, my black 1990 9000S, which was getting pretty tired at 185K miles (and finally succumbed to an engine fire, sadly). 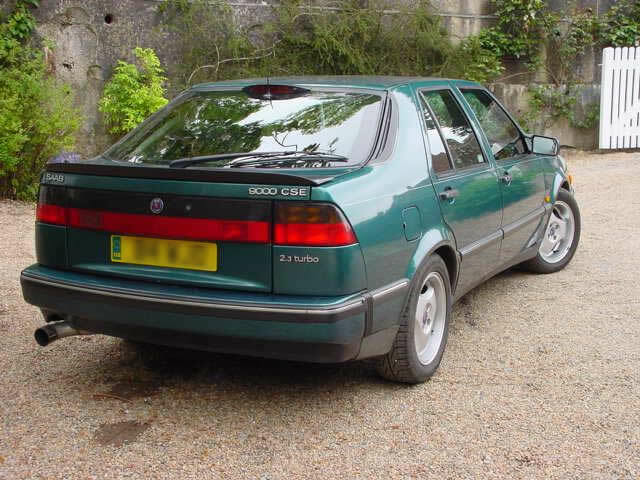 He was advertised as an Aero and was in fact registered as such by Saab Contract Hire, but plainly is "only" a CSE though he did come with pukka Aero wheels, a sports suspension (Aero spring colours) and Saab sports exhaust plus some slightly unusual upholstery detailing. I saw another car with the exact same spec marked as a "2.3 turbo S" so decided that’s what I would call mine. The wheels were in poor condition so I swapped them at Neo Brothers for shiny new 3-spoke Aeros. These wear Pirelli P6000s but I plan to move to Bridgestones next time round – the Pirellis are great but seem to go off when two-thirds worn and living as I do in the West Country I need plenty of wet-weather grip! The car has automatic transmission, guaranteed to raise a groan in some circles. But I chose automatic on purpose, though I know from personal experience that it can break in an expensive fashion. I don’t think the Saab five-speed is all that special anyway, and the auto allied to the turbo engine gives the car a "point-and-squirt" ability that I really like, and use on a frequent basis. There is plenty of torque so you don’t really need to use kick-down. Engine modifications are just to make for better breathing: an ITG air filter element and a turbo-back 3" JT exhaust, which was (a) cheaper than a replacement Saab system and (b) adds about 10 bhp, hardly increasing exhaust noise at all. The suspension is Abbottised, with poly bushings to "butterfly bushes" and both anti-roll bars, lower/stiffer springs, and Koni adjustable dampers. These are set quite soft because on poor roads the ride is a bit lumpy – but it makes up for that on better surfaces and on bends and roundabouts, where The Beast is hard to follow, at least in the dry. Front brakes are Brembo discs with Ferodo DS2500 pads. 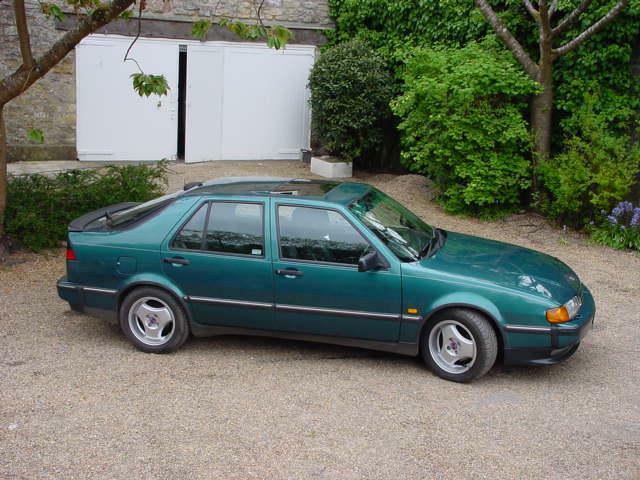 I often toy with the idea of running an old V8 Bristol or something open and sporty, but where else can you get a total package like a properly-sorted Saab 9000?